Why settle for the ordinary when you can have the extraordinary! The Ameraucana was developed in the United States in the 1970’s from the Araucana chicken brought over from Chile. Unlike the Araucana, the Ameraucana does not have the lethel allele that the Araucana possesses. The Araucana is rumpless and has ear muffs where the Ameraucana has a tail, muffs and beard. 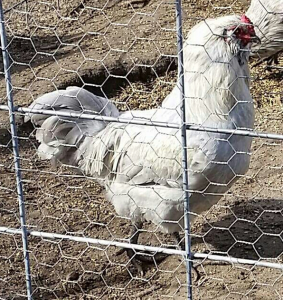 Both breeds have a pea comb and lay the blue and blue green eggs for which the breed is famous. Legs are slate blue to black, depending on the feather coloration of the bird. 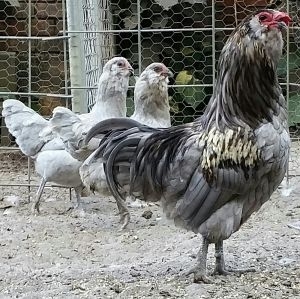 Ameraucana come in both bantam and standard varieties. We breed only the standard variety. Each hen can be expected to produce approximately 3 eggs per week and eggs are medium to large in size. Hatching eggs, when available, are 48 per dozen and chicks are 8.00 each, local pickup/delivery only.